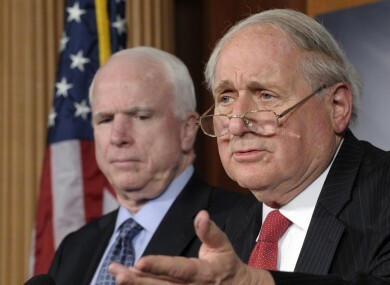 John McCain (left) and Carl Levin are the leading Republican and Democratic members of the sub-committee investigating corporate tax avoidance by US multinationals. TWO LEADING MEMBERS of the US Senate committee investigating tax avoidance among major multinationals have repeated their assertion that Ireland is a tax haven – despite a letter from the Irish ambassador claiming otherwise. Senators Carl Levin and John McCain, the leading Democratic and Republican members of the US Senate sub-committee on investigations, made their claim after Ireland’s ambassador Michael Collins sought to address claims made about Ireland’s corporate tax system during the committee’s hearings on Apple. Collins’ letter – written with the blessing of the Irish Government, and published on the Department of Finance website – took issue with the characterisation of Ireland as a tax haven at the Apple hearings. The communication marked the first time that the Irish authorities have contacted the United States directly to challenge the depiction of Ireland as a low-tax jurisdiction willing to strike deals with multinationals to tax them at lower rates than would be levied elsewhere. “Ireland’s tax system is set out in statute – so there is no possibility of individual special tax rates being negotiated for companies,” Collins wrote in the letter, which is dated from last Wednesday. All tax resident companies in Ireland are liable to corporation tax on their chargeable income at a rate of 12.5% on trading income, and at 25% on non-trading income. Collins said the tax rates attributed to Ireland in the sub-committee’s report (PDF) appeared to be calculated as if Ireland was entitled to tax a company’s entire global profit – when, in fact, the report itself acknowledged that the companies concerned “are not tax-resident in Ireland”. The ambassador also said the characterisation of Ireland as a “tax haven” was incorrect, as Ireland did not fulfil any of the OECD’s four criteria for being so designated. This afternoon, however, Levin and McCain issued a joint statement to repeat their assertion. “Records obtained by the subcommittee clearly reflect that, for years, Apple paid Irish tax authorities a nominal rate, far below Ireland’s statutory rate of 12.5 percent, on trading income,” they said. They added that testimony given by Apple executives, including chief executive Tim Cook and its head of tax operations Philip Bullock, corroborated that Apple had “a special arrangement with the Irish government that, since 2003, resulted in an effective tax rate of 2 per cent or less”. The joint statement from Levin and McCain stresses the bipartisan frustration at the aggressive tax avoidance strategies pursued by large corporations – and by the perception that Ireland is willingly assisting those companies to avoid larger tax liabilities. Collins’ letter had outlined how Ireland was using its EU presidency to try and address aggressive tax planning and profit-shifting among major companies. Email “Senators insists Ireland IS a tax haven, despite ambassador’s letter”. Feedback on “Senators insists Ireland IS a tax haven, despite ambassador’s letter”.